We admit it — we were so busy promoting and talking about the July 4 celebration we got a little behind in discussing our other activities. Let’s start with Jingo. Our monthly Jingo game with residents happens this coming Thursday, July 14, at 6:15pm. Below are some previously unposted photos from one of our recent Jingos at Armed Forces Retirement Home-D.C. The photos show volunteers Kaiya and Karam having a lot of fun with residents playing the game, which is a combination of Jingo and Trivial Pursuit. (The trivia at this particular Jingo was about Grimm Fairy Tales. The group was reminded that some of those tales were indeed, grim!) Residents always have lots of fun, and that makes Jingo fun for us! If you want to participate this Thursday, drop a line to Lori Lincoln at volunteerfriendsofsoldiers (at) gmail (dot) com. Remember, Jingo always happens the second Thursday of each month, so put it on your calendar and plan to come and have fun! It rained and rained for the wettest July 4 of our five annual festivals held on this day. But the weather didn’t stop 1,500 hearty souls from coming out and enjoying DJ extraoridinaire Billy White and the awesome Music Messiahs band. Small children ran fast and free on the expansive driving range while many tried their luck at the fishing hole — and they found they had good luck indeed in such grey weather. We are grateful that Roaming Chicken and Captain Cookie food trucks came out despite the poor conditions. Lots of people enjoyed the treats and cold beer from the beer truck. We are so happy also that many Armed Forces Retirement Home-DC residents and staff braved the conditions to enjoy the day! We are particularly grateful to all of you on July 4! The day would not have been possible without the support of the Nam Knights and all of our other volunteers, and our sponsors, Anheuser-Busch and DCCX. Thank you all! And just as we were all about to enjoy the fireworks down on the Mall, mist and fog rolled in over the tree tops, showing that on July 4, 2016, Mother Nature indeed had the last word. But wetness didn’t dampen any spirits and we are so happy that so many from the community came out to celebrate Independence Day! Rain Won’t Dampen Spirit, July 4th Celebration Still On! 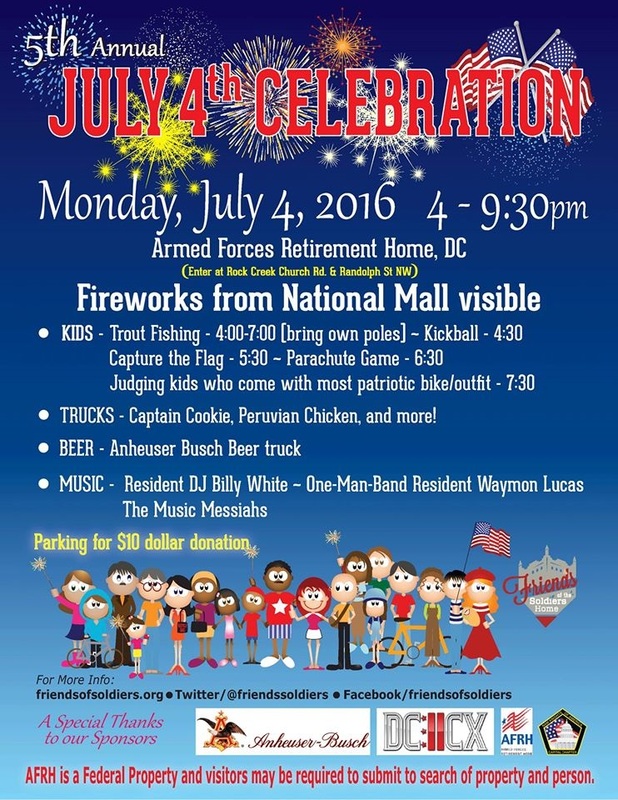 In case you are wondering … yes, the July 4 celebration is on! The rain possibility reminds us why the Soldiers Home campus is so beautiful and green for Independence Day, but don’t let it prevent you from having fun. Weather forecasters are saying we might catch some breaks as we get closer to fireworks time. Come on out! See you there.